This weekend Super7 will be at Kirk von Hammett’s Fear Festival! The metal and horror icon Kirk Hammet will be opening the door to his epic collection of horror memorabilia and showing it off in style with panels, music, and vendors, including a new collaboration between Super7 and Kirk von Hammet Toys! 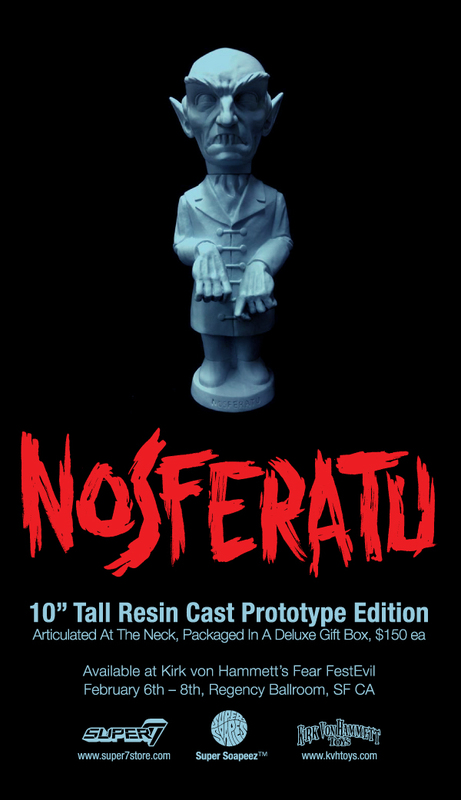 Between seeing such horror and metal legends as Kerry King, Doyle, Kane Hodder, Slash, Haruo Nakajima, Carcass, Tom Savini, and many other exciting guests, Super7 is pleased to debut the new Super7 Super Soapeez™ toy line, with the S7 x KvH Nosferatu Resin Figure! Created in the style of the classic Universal Monsters Soakies, the Super Soapeez™ Nosferatu features one of the earliest classic horror icons to grace the silver screen, the super spooky Count Orlock! The 10″ tall resin figure is articulated at the neck and faithfully sculpted to fit with the classic Universal Monsters Soaky Figures you grew up with. This resin cast Prototype Edition will be packaged in a deluxe gift box and strictly limited to an edition of 50 pieces, priced at $150 each. Additionally, Kirk Hammett himself will be available to sign the figure at the event! The KvH Fear Festevil is this weekend, February 6th – 8th at the Regency Ballroom in San Francisco. Check out the official event page here!